Listen to a sample of "Sometimes"
This one is a head-scratcher. First off, the label says 1979, but it sounds like it was cut 20 years earlier. Cover of the 1961 Gene Thomas hit "Sometimes." Flip side is a standard Hispanic ballad ("A Medias De La Noche"). Was told this was a Pueblo-based group, on an Albuquerque label (Alta Vista 1148), but can't find anything on them, so I will throw this out there, and hope someone can offer up some info. Thanks in advance. 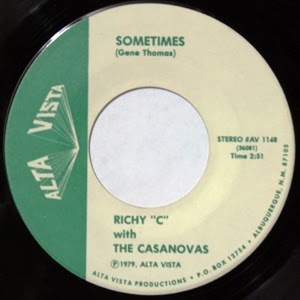 My father is Richy C he was born and raised in Pueblo who recorded the record I believe in 1979 in Albuquerque with in Albuquerque band The casanovas. My father is still alive and lives in Belmont he's a record collector was a DJ for over 40 years Four Weddings parties special events.